When communications design Assistant Professor Rebecca Kelly and her husband, Kevin, bought a coastal property outside the small fishing town of Lubec, Maine, 10 years ago, they always dreamed of building a home for their family. Last summer, their design for an eco-smart tiny home became a reality—as well as the subject of a recent episode of “Building Off the Grid” on the DIY Network. 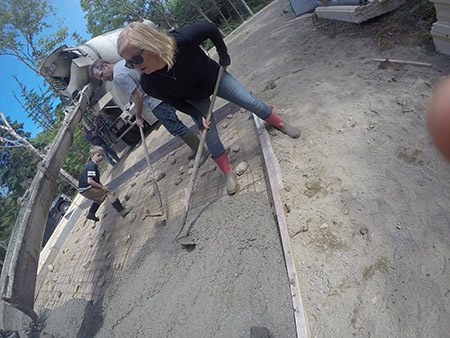 The Kellys pour the foundation for their off-the-grid home in Lubeck,Maine. “Building Off the Grid” documents teams and families who are constructing off-grid cabin projects in challenging backwoods locations. Rebecca, who teaches in the College of Visual and Performing Arts’ School of Design, and Kevin, a graphic designer, proposed a 16’ x 24’ tiny solar-powered home with three floors, two upper decks and 640 square feet of living space. Their design included solar panels on the roof, energy-efficient doors and windows and a wood stove, as well as such unique features as a trap door for entry and a “drawbridge” ladder to move from the second-floor living space to the third-floor bedrooms. Building in Lubec, the easternmost town in the contiguous United States, presented numerous weather challenges, including wind and rain. The Kellys were also challenged by a tight building timeline (three months), a limited budget ($60,000) and a lack of construction experience. With the help of a local contractor and friends, they were able to complete the home on deadline. According to Rebecca, design thinking played a large role in the project. The Kellys’ next project will be to install a wind turbine as an additional source of power for their tiny home.